The Kick-off meeting took place in Florence on 24 – 25 January 2011. The project promoter presented to the partners the project and the activities to be carried out. The meeting was also an opportunity for the partners to get to know each other and to discuss all details related to the project's activities. All the partners presented the national situation in their countries concerning the phenomenon of bullying in school environment. At the end of the meeting all the partners had a clear view of the future project's implementation. The second partners meeting took place in Trakai (LT) on 3 – 4 June 2011. The meeting had the objective to check the activities carried out since the first meeting of the project and to present, share and assess the in progress results. The meeting also had the objective to make a detailed planning of the project future activities and to organize the project's work that will focus on the production of the case studies. A specific session of the meeting was dedicated to the preparation of the Progress Report both from a content and financial point of view. This partners meeting took place online using the Flash Meeting tool on 28 – 29 June 2011. The main base of the meeting was Florence (IT) where all the Italian partners and Jean Yves Stefani from the European Commission gathered. The meeting had the objective presents the European Commission’s perspective and expectations as far as the I Am Not Scared project is concerned and gives valuable suggestions on how the project should be carried out in order to successfully reach the expected outcomes. 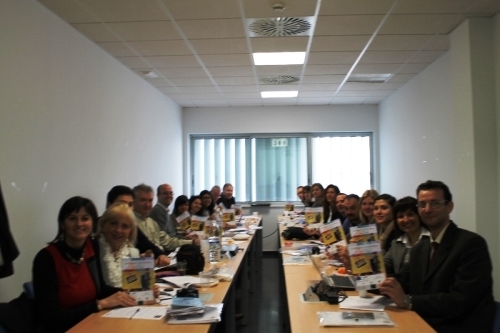 The third partners’ meeting took place in Seville (ES) on 26 – 27 January 2012. The meeting had the objective to check the activities carried out since the second meeting of the project to present, share and assess the in progress results. The meeting also had the objective to make a detailed planning of the project future activities and to organize the project's work that will focus on the transnational discussion of the case studies and the production of the European Strategy to prevent and tackle school bullying. The fourth partners’ meeting took place in Varese (IT) on 26 October 2012. The meeting had the objectives to: check the activities carried out since the third meeting of the project and to present, share and assess the final project results. The meeting followed the final conference held in Milan on 25 October 2012.